He was one of the most popular players of his era and an icon for one of the game’s all-time great franchises. And we’ll always wonder just how much better he might have been had he not suffered that fateful knee injury in the 1951 World Series. Regardless, the Yankees icon and won the hearts of many fans. And that puts his baseball cards in very high demand. And in this guide we’ll look at all his mainstream cards and some of my favorite oddball issues. First let's take a look at Mantle's key mainstream cards from Topps and Bowman before we talk about some of his oddball cards. These are the ones that most collectors are familiar with. But, if you're up for the challenge, it's an extremely rewarding pursuit and his cards should remain in high demand for quite some time. 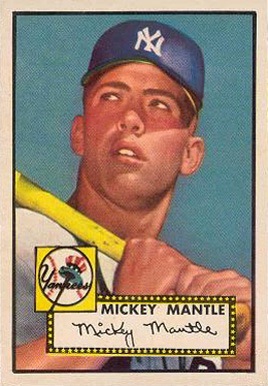 This is the true recognized Mickey Mantle rookie card despite his 1952 Topps issue being commonly misinterpreted as a rookie card. 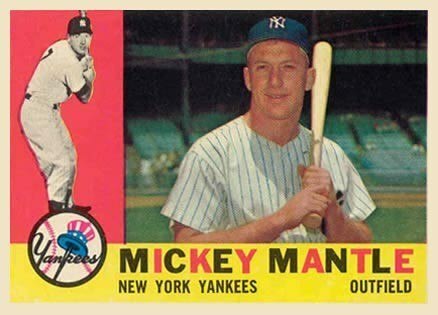 I've always liked the look of this card with its horizontal layout, the artwork and the depiction of Mantle wearing number 6 as he did very early in his career. Along with the Willie Mays rookie card, this is one of the keys in the set to own. Interestingly, although it is his rookie card, this is one of those rare instances when a player's rookie card is not necessarily his most expensive. That distinction would go to his 1952 Topps card. Bowman created another great-looking Mantle card in its 1952 set although it would go with a vertical layout this time around. Personally, I think this is probably his best-looking Bowman issue due to the colorful artwork, Yankee pinstripes, and facsimile signature across his chest. I also think this is one of his more undervalued cards. The 1952 Topps #311 is by far Mantle's most popular baseball card and one of the most recognizable in the entire hobby. Some would argue it has even overtaken the T206 Honus Wagner as the face of the baseball card world. Either way, the demand for this card remains sky high. And that has driven up prices making it easily one of the most valuable baseball cards in the hobby. Mantle's career would start rolling in the 1952 season as he'd go on to make his first of 20 All-Star appearances that year. In 1953, Bowman would issue its first set to feature full-color photography. The design of the front were nothing more than that, just a picture of the player with no name, position, or team listed anywhere. Despite that simplicity, these cards are favorites of many collectors. Mantle's 1953 Bowman card is instantly recognizable as the young Yankee slugger is shown following through on a monster cut. If you ask me, this is easily one of Mantle's best-looking cards. The artwork on the 1953 Topps design is incredible. The image of the young Mantle looking back over his shoulder, stadium in the background and the red nameplate in the lower left all combine to create amazing eye appeal. Centering and chipping along that red border are two of the biggest condition challenges with these cards. So, in top grade, these can easily go for five figures. The 1954 Bowman #65 is another Mantle card that I think could be a bit undervalued. The imagery is great due to the blue sky, his bright smile and the facsimile signature along the bottom. By 1954 Mantle had really settled in and his production at the plate was incredibly steady. Next up is one of the more unusual but unique designs of any Mantle card. For their 1955 set, Bowman would choose a layout that looked like a television set. It was definitely innovative and you can't argue with its creativity. Those brown borders, however, are very susceptible to showing wear and tear so finding these in high grade can be tough. 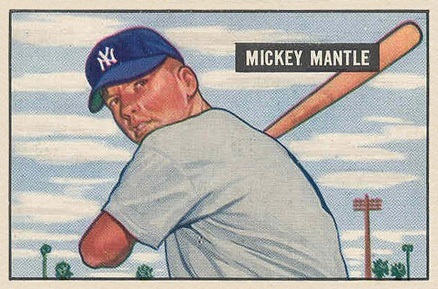 After not appearing in their 1954 set, Mantle was back again with Topps for their 1956 release. And during that year, Mantle would turn in an absolutely monster season that would earn him a Triple Crown Award and his first of three MVP honors. For that reason, along with its beautiful design, this card remains extremely popular with collectors. Its the key to the set, with centering being the toughest challenge with this one. Topps would use full-color photography for the first time in its 1957 set. Because of that, this card is a favorite among many Mantle collectors. The view of Mantle following through on a swing is great but I've always felt the card felt a little drab due to the dark lighting. Regardless, it's still a great one to own but finding them centered can be difficult. Mantle would win his second MVP award for the 1957 season and that helps boost the value of this important issue. Opinions on Mantle's 1958 Topps issue can be mixed because of the orange background but to me it's a great-looking card. I actually think that background gives the card some nice pop. However, sometimes you will see them with print markings which can drag down the appeal. The set overall had its fair share of errors and variations but the Mantle card escaped all of that. Amazingly, he would lead the league in runs scored (127), home runs (42) and RBI (129) all at the same time during the 1958 season. To round out the 1950's, Topps produced cards that looked very similar to the year before but with enough tweaks to set them apart. The names on the front were all lower case and tilted, players were encircled, facsimile signatures were added, and the team and position info at the bottom were rearranged. I do prefer the red background of this one to the orange in his 1958 Topps release. Centering and print marks in the background are two primary condition challenges with this card. I always liked the dual-panel design of the 1960 Topps baseball cards. This one features a black and white pose of Mantle at bat along the left side and a nice color photo of him on the right. The yellow name plate along the bottom is a great touch and keeps this card nice and bright. Mantle put up a solid stat line in 1960 and finished second in MVP voting behind Roger Maris that year. The 1961 season saw Mantle and Roger Maris going head-to-head trying to break Babe Ruth's single-season home run record. Maris would go on to set the new record, finishing with 61, while Mantle turned in 54 of his own and would again finish second in MVP voting to Maris. The 1961 Topps set came with much better print quality than other sets of the era so finding these in top condition is relatively easier. Still, rough cuts, print bubbles along the nameplate at the bottom and centering can be common condition issues. One of the most condition-sensitive Mantle issues of the 1960's due to the woodgrain borders, this one can be tough to find in high grade. The woodgrain design is definitely unique but can easily show wear and tear. Mantle would win his third and final MVP in the 1962 season so that also adds to the value of this card. It's a rather plain-looking card overall compared to some of his others. 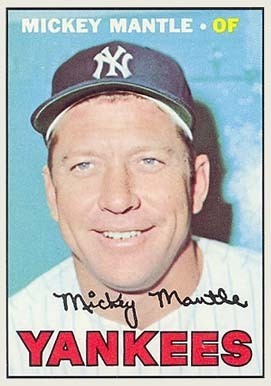 This is one of my favorite Mantle cards of the 1960's. I've always loved the dual imagery with the smaller black and white shot of Mantle encircled in the lower right corner. The design of this card really stands out among the rest. And the green nameplate at the bottom gives it nice balance. However, those green borders are very susceptible to showing wear and tear while print dots also commonly show up in that area. The Pete Rose rookie card is the key to this set and one of the few times Mantle's is not the most expensive. 1964 was another one of Topps' better years in terms of print quality making these relatively easier to find in top grade. The bold, red block lettering of the Yankees team name across the top gives this card a very solid appearance. And the demeanor in which Mantle is posing during batting practice also adds to a very serious tone. Centering is probably the biggest issue you'll find with this card. The 1964 season would be the last time Mantle would surpass 30 homers, 100 RBI and hit above .300 which helped him finish second in MVP voting that year. Byt the time the 1965 season rolled around, age and injuries were taking a toll on Mantle and his production would start to diminish rapidly. But, that didn't stop him from producing some great-looking baseball cards, especially this one. The 1965 Topps design is also one of my favorites of that decade because of the imagery, color schemes, and that team name pennant at the bottom. Centering and tilt can prevent these cards from achieving higher grades. Like his 1964 Topps card, I have always thought this is another case where his card has a very serious look and feel overall. I think the concentration with which he poses and the red team banner and nameplate are what drive that. After being named to 14 straight All-Star teams, Mantle would miss out on that honor for the 1966 season. Although it may seem a bit plain in design, the 1967 Topps Mickey Mantle issue is bright and full of pop. The beaming smile on Mantle's face and the bright blue background make for a great-looking card. This is one of his cheaper mainstream cards as it can be easier to find in top condition. But, still, cheap is a relative term as with any Mantle card you're going to have to pay up for it. This is another one of those rare instances in which Mantle's card is not the most expensive in the set--that distinction would go to the Tom Seaver rookie card. This is Mantle's cheapest mainstream card as this set was arguably the easiest in terms of print quality. Centering and wear along the burlap borders can be issues but overall, they're much easier to find in high grade than his other cards. I want to say this is the only other set in which his card isn't the most valuable due to the Nolan Ryan rookie card also being in the 1968 Topps set. Opinions are mixed on this card because of the burlap borders but I still think it's a great card. 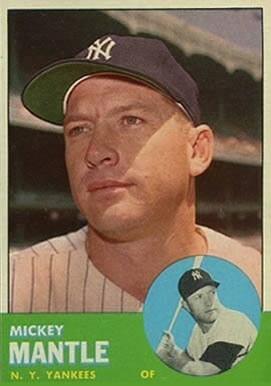 The 1969 Topps Mickey Mantle issue is the one time where you can find his card in one of two variations. The one with his last name in yellow is by far the most common but it still isn't cheap in top grade. It's the variation in which his last name appears in white that's far more rare and prices can become sky high for top grade specimens. Even though the Reggie Jackson rookie card is probably the most recognized in this set, the white letter variation Mantle is more expensive. Notice anything familiar with this card? Yes, that's the same image that was used on the 1951 Bowman Mickey Mantle rookie card. Although, this time the clarity isn't quite as good as you can tell. The 1952 Berk Ross "Hit Parade of Champions" cards were thought to have been distributed around the New York area due to the heavy volume of Yankees, Mets and Brooklyn Dodgers players in the set. Many other teams either had one or no team members represented. Players like Jackie Robinson, Willie Mays, Ted Williams and Joe DiMaggio are also included in this 72-card set but Mantle is the most sought-after. These 3-1/4" x 4-1/2" cards with rounded corners are some of the rarest Mantle cards in the hobby. Packaged along with their hot dogs, the Stahl-Meyer company released this set in 1953. Only nine cards were included, three cards each for each of the regional teams, the Yankees, Giants and Dodgers. You can imagine how condition-sensitive these cards can be given they were packaged with hot dogs. Regardless of their condition, just finding one at all can be quite a challenge as these are rarely seen. Another important regional food issue, the 1954 Dan-Dee Potato Chip Mantle features the same image as the 1953 Stahl-Meyer card. They are a bit smaller, though, measuring in at 2-1/2" x 3-5/8" and they don't come with rounded corners. These are also very condition-sensitive due to the fact that the oils from the chips with which they were packed often produced a lot of surface stains. Here is another food issue card, except this time these were offered in exchange for mailing-in labels of Red Heart dog food. There are 33 cards in the set overall, broken into three series of blue, green, or red background cards. Mantle may not have been included in the 1954 Topps set but as you can see, that didn't stop him from making deals to appear on oddball issues. 1959 would be the first time that Bazooka would print baseball cards as these appeared on the bottoms of Topps bubble gum boxes. They were also surrounded by dotted lines in order to guide any collector who wanted to cut the card out of the box. You'll frequently find these with cuts that aren't so straight or that have cut beyond the dotted lines. Despite how condition-sensitive these are, collectors love them in almost any shape. Of the 23 cards in this set, Mantle's card is considered the key and this is likely his most beloved of any of his Bazooka issues. The New York Yankees endorsed many Yoo Hoo products throughout the 1950's and 1960's but this is still one of the more obscure Mantle issues out there. The black and white image of Mantle give the card kind of a boring look and feel but the facsimile signature and company slogan "Me for Yoo hoo" at the bottom are a nice touch. You just don't see this surface too often but if and when you do, you'll have to pay up to own one. The 1961 Topps Dice Game set is one of the company's rarest test issues. The card actually looks pretty decent overall featuring a nice shot of Mantle in his batting stance. These cards were never issued to the public and it is believed there are only two examples of the Mantle card known to exist in any condition. Because of that rarity, you can see that even in poor condition (PSA 1), this card will fetch a monster price tag into the six figures. This is just another example of how rarity can drive up the price of cards in this hobby very quickly. Mickey Mantle is one of baseball's most iconic players and this article was an absolute joy to write. Because he was so popular, there were so many oddball and regional Mantle cards produced. So, it was difficult to come up with my top favorites for his oddball issues. I may even have to come back and edit this in the future to add more. What can't be argued, though, is Mantle's status among Yankee legends and other great ballplayers of the Major Leagues. And when you consider he did all that after suffering that devastating knee injury during the 1951 World Series, it's even more impressive. Mantle goes down in history as one of the greatest Yankees to ever play, and in 1974 he would be immortalized after being inducted into the Baseball Hall of Fame.